Set in the green vegetation of a large park of 5000 sq.m, and only 400 m from the beautiful white, sandy bay of Marina di Campo. 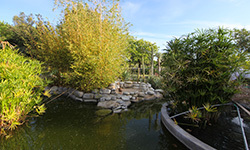 Children’s games, solarium, table tennis, patio with equipped barbecue and a large pond with fish, ducks and peacocks are available for the guests. Informal, indicated for families who love nature and tranquillity. It offers a very relaxing holiday thanks to the hospitality of the proprietors who take care of everything in detail. Covered car park and private beach convention. Comfortable, large and luminous. They consist of open-plan living room and cooking area, bedroom and bathroom. 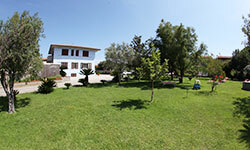 They are well furnished and have satellite TV, safe, phon, heating and microwave furnace.